Aerial photo of the store. Queensway House and Hatfield Library are to the right. 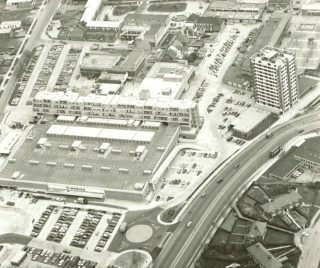 In the late 1960’s and early 1970’s the then Hatfield Rural District Council and the Commission for the New Towns were concerned about the inadequacy of the shopping facilities within Hatfield Town Centre. The solution was to adopt a new system of trading introduced by the Woolco Division of F.W.Woolworth Ltd. The new store was described as “An out of town department store in the Town Centre”. 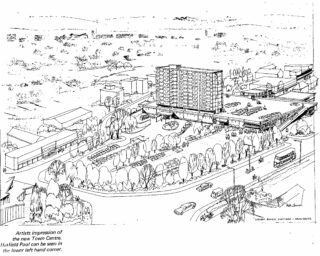 As well as 100,000 square feet of shopping space there was also to be built-in car parking accommodation, a block of flats built above the store, a Town Centre filling station possibly incorporating a ‘car clinic’ and five additional small shop units. The store and flats were to be built on the site of Gracemead and Railway Cottages which had been recently emptied and over the carriageway of the former St Albans Road and sealing off the western end of the pedestrian precinct. This new ‘larger than life’ Woolco Department Store opened in the Town Centre in the autumn of 1972. 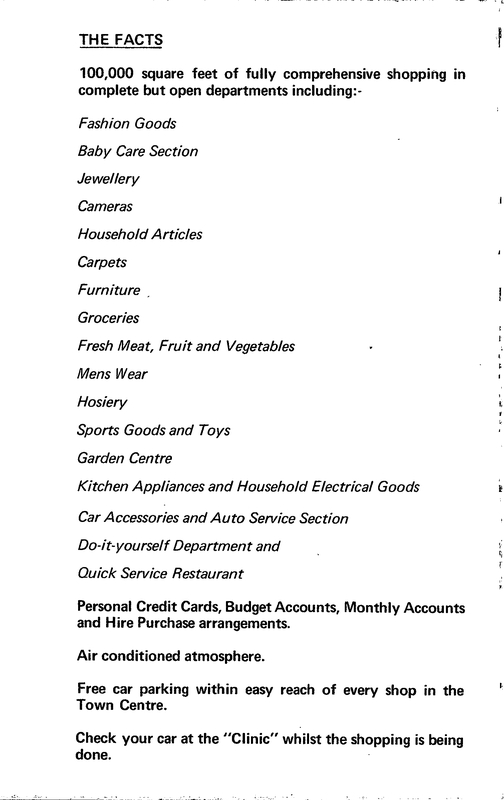 In 1982 the store celebrated its 10th anniversary by announcing ten days worth of special offers and events to attract shoppers. There were also visits by celebrities such as boxer Henry Cooper, Ruth Maddox from TVs Hi-Di-Hi. 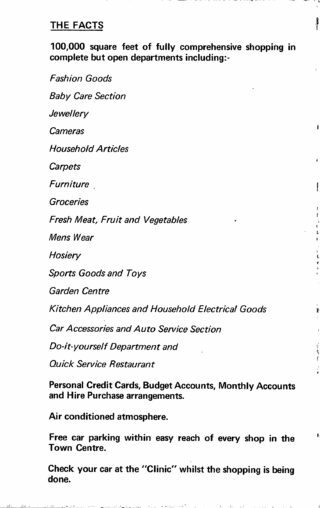 Sadly Woolco’s closed in late 1985 the site being taken over by Gateway’s who in turn closed in 1989 when Asda store took over. In the late 1990’s Asda demolished the building and erected the new, modern, purpose built shop, we see today. Do you remember shopping at Woolco? Share your comments and memories below. This page was added on 09/03/2014. I recall when I was around 10 years old my mates and I used to cut through Woolco to get to the swimming pool behind it. Was a good shortcut. I left Hatfield in 1976 when my father relocated to Buckinghamshire. We had a brand new maisonette in Great Health. I’ve been back for a quick peek a few years ago. Doesn’t look the same now. Do you still have the funny statues and fountains in the town? I was at Hatfield Polytechnic in 1974 and after visiting Norway that year was surprised that I could walk straight into Woolco and buy Gjet Ost which is Norwegian goats cheese and the first place I found it on sale in the UK! My mum and dad brought me my first ever pair of trainers there in 1980 and loved the cafe. My Father, Richard Brazier, was the general manager of the Woolco store in the 70’s. I have such fond memories of playing in that store as a kid with my sister. I remember watching acts like Musical Youth and Bernie Winters (inc Schnorbitz the dog) visit the store for promotions. I remember Woolco’s well, I had a part-time job in the loading-bay, processing goods-in. Working to the bay manager (Mr.Manley) . I was a school-boy/student and the pay was better than a paper-round! I recall Clive, Pete, & Chris but there were many others. The staff were a bit of a community. I recall the personnel manageress (Miss McFee?) who seen quite concerned when I left to get a real job! Anyone else out there from those days? We lived in Redbourn when Woolco opened and we would visit at the weekends in my dad’s Cortina – remember those ? I was about 6 or 7 and I used to head straight for the toys and stay there until my Dad would come look for me. I worked in Woolco under the management team of Richard Brazier and general manager Nick Curry Malcolm Tilsed until the store closed. 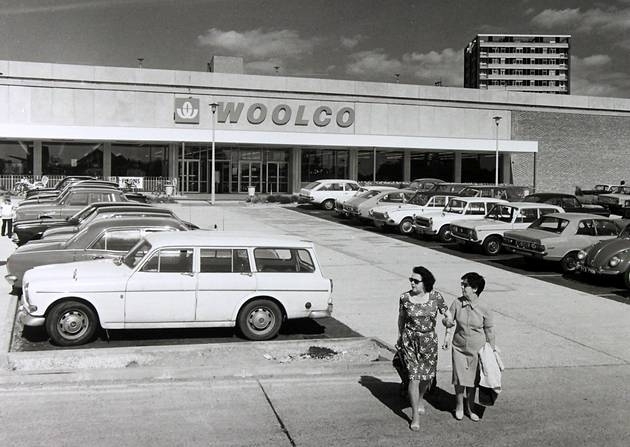 I remember Woolco when I was a kid, my mum going there with me and my sisters. This was when the town had loads of shops and the waterfalls in the big round enclosures with big shells. Loads of memories. Hello, I forgot to say the following , I am Michelle and i already have 2 notes here but had to send a 3rd in as i forgot to mention this. woolco wordsign on front of store was RED in colour. public phone at front of store or many phones there – can’t recall how many. the outer staircase shown at end of flats in photo above on right side – the concrete steps seen here were enclosed in a vertical see through glass tunnel – for safety maybe so people not fall over them. the glass shows as mist grey in photo shown here. in the inside carpark under the 1st floor flats where the 2 black holes are in photo above were glass doors with wooden frames that led to stairs which led up to flats above one at each end and they ran next to lifts a lift at each end. the back wall of lifts in the flats was green in colour as i mentioned in my other note here – it was an olive army khaki green – the rest of lift colour was grey or all khaki green – can’t recall which. back of lifts opened up if needed by a khaki green metal 2 backdoors with no handles just push them open - gave more floor space – don’t know why – maybe for more people. glass door inside flats which led onto the flat corridors and glass door leading outside at each end of back of flats were full glass doors and sheets of glass windows next to glass doors – same height and size as the glass doors, so could see outside when leaving the flats at back entrances. lots of sheets of glass doors and glass huge windows the size of the doors at all entrances, all see through glass doors to the outside and in inner carpark which led to flats’ staircase. our flat door was wood though and not see-through. there were also 2 other outer stairs which were one each end of the big upper carpark – set right at the front – one each side. led right down to very front of woolco. the cars i mentioned before in other note here i forgot to say – that on saturdays there were a few cars there – well Ii meant by a few cars – a few rows of cars – not just a few cars. rest of time that huge upper outside carpark was empty just how it is shown in the photo here. most shoppers used the lower outer carpark in front of woolco. my mother told me the big upper one was only for flat residents but maybe she got it wrong as the residents had their own carpark under the 2 holes shown in photo here – the black 2 holes led to it – it was not dark in this carpark under the holes shown in photo here as one would think as hole entrances look dark, light was in there and it was shaded too, but not dark. it was cosy as well and the residents of flats above parked their cars in there and then walked through glass doors to lift or stairs up to flats – stepping up onto a concrete big stone step to get to the glass door – two same sets of lift and stairs at each end, brick pillars in there too. very neat and tidy and clean and quiet. my parents parked their two cars in there and then went up to our flat above woolco. i never saw no one when i lived there or when i visited my dad and sister there when my mum and i left and moved back to our old terrace war-time house, the corridors of the flats were always empty and i saw no-one except in woolco when shopping with mother when i was 11 and 12 years old . woolco sold chocolate and lovely packets of toffecrisps, four in a packet, that mum used to buy as our weekly treat. oh i recall the records were sold in a small section to the left of store if coming in from back entrance sort of half-way up the store. it truly was lovely inside and very cosy and so nice and cosy when my mother and i went shopping in there late at night as opened till late. we got lift down from flat above and went in back entrance, using lift and stair case on right side of photo above but at back of flats and inside so can’t be seen in photo here. out through the huge glass doors with huge glass door size windows too so we could see outside as we were still inside just about to open the glass doors to go outside, up the back and into the big back entrance. i recall shopping women wearing flared trousers walking out the back way in woolco as in the 1970s i lived there. i hope all this has been of help and interest to you. i still have photos of my family in our flat above woolco in the 1970s. would be nice if the flats above were still there as a nice way to live for a while in the flats above and shop just downstairs in that huge AMERCIAN STORE CALLED WOOLCO. is a clever idea really who thought of it and made it so nice and cosy and to live above it too. we were lucky as our flat was in middle floor and faced swimming pool . my dad was caretaker and rent and bills were free and he got a wage too – parents rented out our terrace war time house to pay the mortgage while my mother and father lived rent free in flat above woolco. hope this has been helpful and of interest to you. as i lived there i know and recall exactly what those flats etc looked like inside which the above photo can’t show as only shows the outside. looks beautiful the aeriel shot of it. how i remembered it too. take care, be nice to hear from others about it too, 3 notes here from, Michelle. Hi, i am Michelle. i wrote here before e.g. see my name on other note here. i forgot to mention these others things – in case anyone is interested in it. Woolco the American supermarket in Hatfield seen in photo here was so so huge big inside. it was cosy and lovely but the lights were too bright. 2 sets of cash tills where the girls sat, one at the back of the store and one set at the front. my mother and i used the back ones the most as when we went down in lift from above flat it led there but outside and we just walked into the back entrance. huge big freezers of food, and clothes, kitchen stuff, nice cafe at back corner with plush thick dark brown carpet. records sold here too. toys, curtains, lots of things. the floor was white and shiny. the food was on the right side corner of it if coming in from back entrance but tucked up way away from tills around corner. the big outside car park which i could see from our flat above was always empty of cars just how it is in the photo here but on saturdays were a few cars. the 2 black square holes in car park at back led to another carpark inside underneath the 1st floor of flats above. it was cosy and had lots of cars in – residents cars. had brick column pillars too. my parents parked their cars in there. up the ramp to get to it. was a car ramp on other end of flats too – petrol station there. the outer stairs that can be seen in picture i used to go in them but i recall another set on other end of flats – not sure as can’t see them in photo here. the flats my mother says were all for single people and we were the only children there but our next door neighbours were an old couple and she had worked for the Queen Mother as her lady of waiting and were given the flat in return for that. there were huge silver-grey metal rubbish shoots. inside were 2 lifts. green in colour. long white corridor, floors all shiny. my mother cleaned and buffed them and i swept them and inside concrete stairs sometimes for dad. as he was caretaker of flats the rent was free and the electric bills. i went to school a few miles away from Hatfield and mum or dad ran me there in car or i got bus from side end of flats right side. as ours was a 3 bedroom flat we only had a tiny balcony to the outside. some balconies were so long. ours in middle of 2nd floor facing Hatfield star shaped swimming pool. in ’76 the hot summer my dad let me, sister, friend sunbathe on roof of flats. we sat by big brick thing on top of roof on left side of photo- thank goodness i only went up there once as dangerous can fall off edge. the opening up to there was a dark cubby hole up high and up a ladder to get there. my dad had the keys to unlock the ceiling door. car park empty at top as shoppers parked in the big ouside ground floor car park. my donny osmond, osmond, elvis posters were up on the bedroom wall in the flat here. i don’t think i would like to live up high again as dangerous and have to be careful not fall out the window or off balcony and i recall sitting on balcony edge which was black on top of the bricks – with my legs hanging over the edge with my sister too and dad eating his sunday dinner out there at same time. our flat was 70s decorated inside as it was the 70s. red and gold wallpaper and gold big sofa and a bar for drinks. long corridor lead to kitchen and lounge and bedrooms were to left and front of our flat as come in front door. all flats looked different inside. 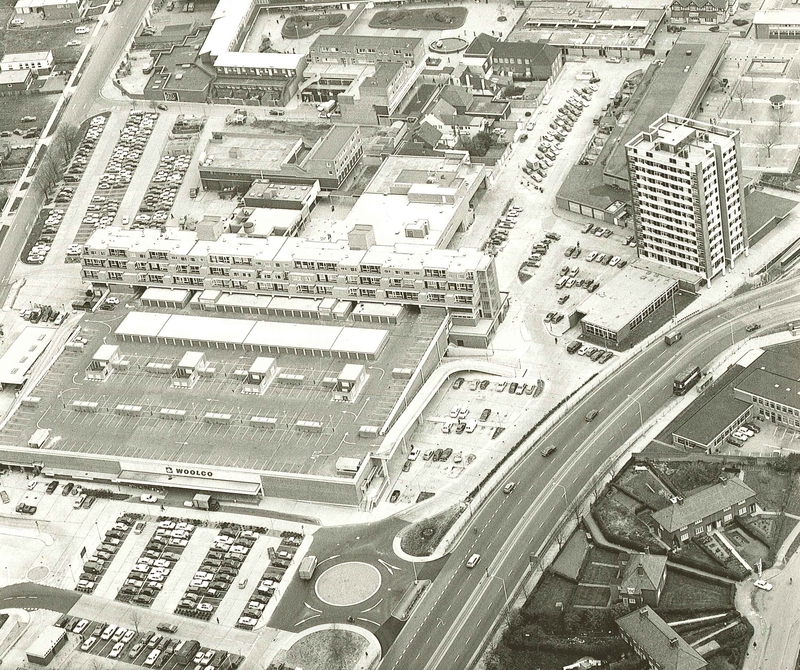 i am glad i only lived there for 1 year (1973-4) age 11 and 12 as me and mum moved to a war time old terrace house outside of Hatfield – returning to the house we lived in before we moved to the flats – they were called TRIDENT HOUSE – were the flats shown here above WOOLCO. we got our dear small cat Samantha black and white cat and our golden dog Sandy when we went back to our old house but dad and sister lived in flats still all through the 1970s as mentioned in my other note here. thick snow here so bad one year. i felt sad and upset when i went in ASDA once as looked so modern and different even though woolco was a 70’s modern store. but nicer inside than ASDA the new replacement. American woolco gosh so big inside. sorry i forgot to say the cans of food were on shelves like in normal supermarkets. i am so glad there is a photo of it all as it is nice to see it again and is exactly how i rememered it from my childhood. when i think about it it really was amazing etc to live on top of a huge supermarket like that and all the people and things in it every day below us as we lived in flat above. be nice if had glass holes in top outisde car park as could see inside from up there into woolco below us but they not build it like that. the artist’s one here is not as nice as the one they built shown in real life photo here. i must print it out and send to sister. my parents rented out our old war time terrace house while we lived here rent free and bills free as my dad caretaker of TRIDENT HOUSE flats above Woolco here. so lodgers paid the mortgage on our little terrace house. a good idea of my mother’s this was. well i hope this is nice to read about what the flats were like and woolco as i lived there and shopped there. i read here that it was built on grace and the railway – i think that would have looked nice and been all old and quaint before woolco was made. the bricks of the flats above where i lived as a child for 1 year were a beige buff colour not brown brick. each flat had a balcony. i still have photos of us in the flat and us on the balcony. we went swimming in the star shaped pool opposite too. i never saw anyone else who lived in the flats not once. corridors empty. a lift at each end. never saw our neighbours either not even the lady who worked before as maid to Queen Mother but my dad must have as he went in the flats to see to repairs and other things and cleared out the flat when someone died. My father and mother, sister, brothers used to live in the flats above woolco 1973 etc. my dad was caretaker of the flats. it was lovley and me and mum only had to go down in the lift to go shopping inside. open late nights too. snowed there two nights before school. found out elvis died in that flat above woolco in August 1977 in my school holidays . we were in middle flat on second floor facing the star shaped swimming pool, which also had a concert hall down low and the famous singers appeared there – like the stylistics, etc. i lived there for 1 year then me and mum moved into old terrace war time house, dad stayed in flat and sister. I still visited though in all the 70s. Saw dog once in town centre who was sick poor thing. watched elivs funeral on t.v. from here live from graceland memphis america Michelle. I worked in Woolco from the time it opened until I got married in May 1973, it was great seeing the inside being fitted out. I worked for the Fashion Retailer and we in the corner of the shop near the outside car-park. There was a place at the front of the store where you could leave your shopping bags while you shopped. I remember thinking it was great not to have to go to work until 10am on weekdays but of course we did stay open until at 8pm, which was something new then. The shop closed for half day on Mondays so we had to start early then – 9am. The store had it’s own chaplain who was a lady which I thought strange at the time but she was very nice. I can remember the ramp up to the roof car park, we tested the handbrake of my car and hill starts on that ramp the day before my driving test. I remember Woolco dept. store it was the best thing since Tingeys and Whites.